Pear Shaped Diamonds: What's the Best Engagement Ring Ratio? Pear Shaped Diamonds: What’s the Best Engagement Ring Ratio? Buying a Pear Shape Diamond Ring? 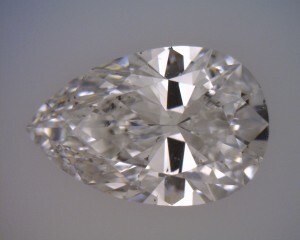 Pear shape diamonds (sometimes referred to as tear-drop diamonds) are usually paired with a tapered solitaire setting like this or an intricate halo setting like this. 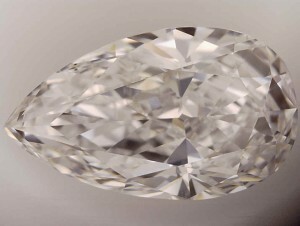 Pear Shapes (and other soft-sided fancy shapes such as Marquis and Oval) are among the diamond shapes that show color the strongest. 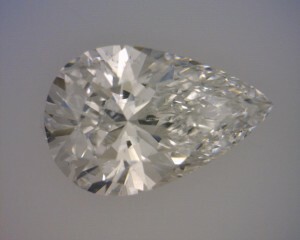 The only two shapes that perhaps show color more than this grouping are the Cushion Cut and Radiant Cut. That being the case it is best to stick with H color or higher to ensure that your stone will look white. This of course only applies if you’re setting the stone in white gold or platinum. If you’re setting it in yellow gold or rose gold, feel free to drop down to J or K and save the money or buy a larger stone. Stick to SI2 clarity or SI1 clarity for the best value. 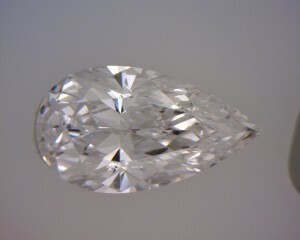 Pear Shapes, like round brilliant diamonds, are great at concealing inclusions. At the rounded end of the stone, they work as well as a round stone. At the pointed edge, it’s even stronger at hiding inclusions making it almost impossible to see any imperfections. Still, a concentrated black SI2 in the center of the stone will definitely be visible to the naked eye, so you still can’t trust a site listing virtual inventory at their word regarding checks for eye-cleanliness (see my Blue Nile Review for why that is). Of course, only use a vendor that offers high quality photos (like James Allen). Inspect the photos and only trust a vendor’s eye cleanliness check if they’re checking it themselves (as does James Allen). As with cushion cuts, the suggested parameters are not particularly strict. With pear shapes, the numbers on the certificate matter much less than other shapes (such as round and princess). Unfortunately, you will never find the really important things regarding pear shape cut quality on a certificate. For example, you’d never know the roundness of the round side of a pear shape just by looking at the certificate. Some pear shapes have very boxy round sides whereas others are properly curved. Some slope towards the point in a rounded way, whereas some are straight and come to a point like a triangle. With Pear Shapes, it is absolutely critical that you see at least a photograph of the stone and see with your own eyes how it looks. While pear shapes are certainly not among the most popular shapes these days, I must confess that I am personally a lover of this shape. I can’t put my finger on the particular aspect of this shape that I love, but I have a feeling I know what it is. You see, the vast majority of pear shapes out there are absolute junk. I know when I go online to help readers who are looking for pear shapes, I can look through 20-30 stones before I find one with a nice cut. Most pear shapes cut today are too short and stubby. Others are too long. Others aren’t properly rounded on the round side of the stone. The list goes on and on. So I think the reason that I love a beautifully made pear shape is simply that I recognize how special and rare they are. It’s easy to find a stunning round brilliant or princess cut. They’re all over the market. But to find a properly cut pear shape truly is a find. On of the most common way pear shapes are miscut is with an out of balance length to width ratio. Most people find that they prefer pear shapes with a length to width ratio of about 1.55 to about 1.75. As you can see in the picture to the left, a L/W ratio of 1.41 already looks way to short and stubby for a pear shape. This stone looks like a slightly stretched out round shape – not what you’d like to see in a pear. In the picture to the right, you can see the opposite extreme. 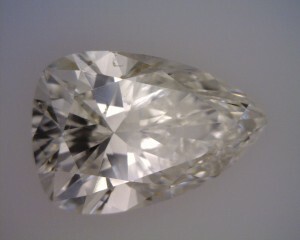 This stone has a L/W ratio of 2.17 which is way too long for a pear shape. And finally, Goldilocks, we’ve come to the stones that fit just right. To the left and right you can see beautiful examples of stones that are at opposite ends of the acceptable range of L/W. Where your preferences lie between these two boundaries is just a matter of what shape speaks to your tastes. 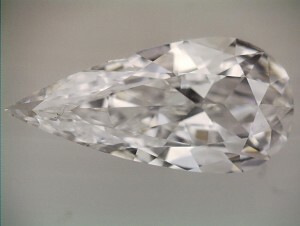 While Length to Width ratio is something that you can calculate yourself by viewing the diamond’s measurements on the certificate, the silhouette of the stone is not something you can figure out on paper alone. 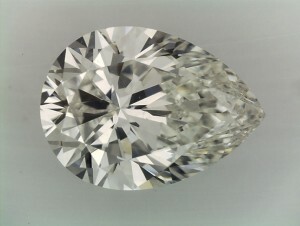 How the diamond is shaped, strictly in 2-dimensional terms, is really one of the most important aspects to a pear shape. This is the case particularly with pear shapes (and perhaps heart shapes as well), over and above all other shapes. The reason is simply that the pear shape’s silhouette is its signature. Think about it – every other shape is a basic symmetrical geometric shape. Only the pear shape has this unique asymmetrical shape with a different top and bottom. So how the stone makes its way from the round end to the point is what this shape is all about. In this section, I would like to point out a couple of commonly misshapen pear shape types. Firstly, to the left, you can see what I like to call the “triangular” pear shape. If you look at the picture, you’ll see it’s obvious why I call it this. The left side of the stone (in this picture) is supposed to be a perfectly round semicircle. Instead, it’s nearly flat. Furthermore, the sides of the stone should have a bit more curve to them. A close relative to the “triangle” pear shape is what I call the “flat-back” pear shape. These are basically one step better than the “triangle” since the only noticeable problem is the flattish back whereas the sides still have the proper curve to them. The next common misshapen pear is what I call the “too curvy” or “too wide” pear shape. See the picture to the right. Here, you’ll notice that the sides that come around towards the point do so with too wide of a slope. It’s almost like it wants to be an oval as it comes around the sides and only decides it wants to be a pear shape at the last second as it closes to a point. It’s not a smooth slope all the way around. See the diamond to the left for a classic example of what a bow tie is. The “bow-tie” refers to that pattern that you see in the stone to the left running North to South in the photo running through the center of the stone. This is yet more reason why it would be a very big mistake to buy a pear shape sight unseen. There is simply no way to tell whether or not your pear shape will show an ugly bow-tie like this simply by looking at the certificate. There is no magical combination of parameters that you can remember that will guarantee your stone won’t look like this. You must see a photo of the diamond so stick with a vendor like James Allen!